The Qualcomm Snapdragon 855 Mobile Platform is a high-end smartphone and tablet SoC that Qualcomm announced in December 2018. The SoC integrates a fast ‘Prime Core’ that clocks up to 2.84 GHz and three further fast ARM Cortex-A76 performance cores, which can reach up to 2.42 GHz. These are complemented by four power-saving ARM Cortex-A55 cores that clock up to a maximum of 1.8 GHz. The higher ‘Prime Core’ clock speed should provide significantly better single core performance than the Snapdragon 845, but we suspect that the Snapdragon 855 will fall short of the Apple A12 Bionic. The new SoC should have up to 45% faster single-core performance and 35% multi-core performance than its predecessor. 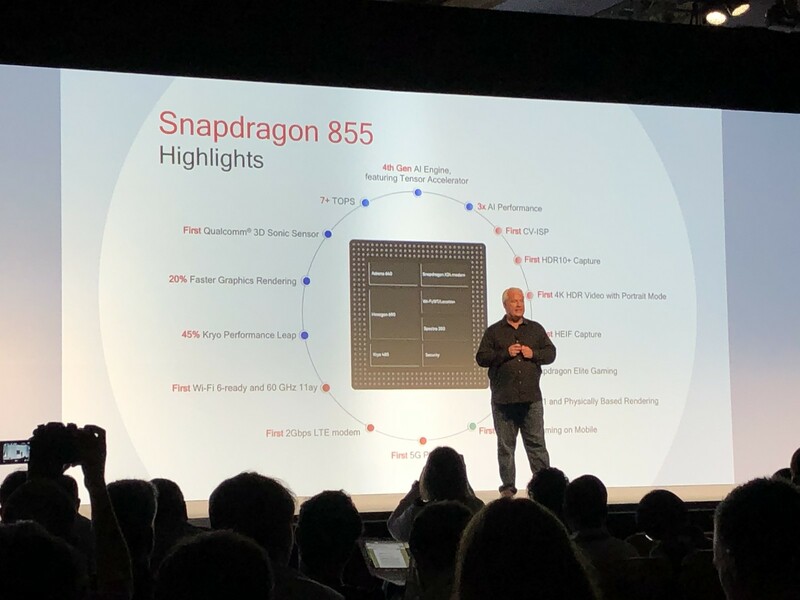 Qualcomm praises the Snapdragon 855’s ability to maintain its performance when faced with sustained load, beating the Apple A12 Bionic SoC and the HiSilicon Kirin 980. The SoC also integrates the new X24 LTE modem that Qualcomm promises will deliver up to 2 Gbit/s maximum download speed over LTE Cat.20 and up to 316 Mbit/s upload speeds. The Snapdragon 855 can be configured with the company’s new X50 5G modem too. Qualcomm has also improved the integrated Wi-Fi modem, which is Wi-Fi 6-ready, has 8x8 Sounding and supports up to 802.11 ay Wi-Fi. The Wi-Fi modem can utilise the 60 GHz mmWave band for up to 10 Gbit/s internet speeds. The Hexagon 690 DSP has undergone the most revisions of that which Qualcomm has integrated into the Snapdragon 855. The new DSP incorporates a neural processing unit (NPU) with dedicated Tensor-cores that can execute up to 7 trillion operations per second in conjunction with the CPU and GPU. In short, the Snapdragon 855 should be three times faster than the Snapdragon 845 and two times faster than the Kirin 980 SoC. The Snapdragon 855 also has a Spectra 380 ISP onboard, which is the world’s first chip to incorporate a Computer Vision Engine (CV-ISP) that can perform depth calculations in videos at up to 60 FPS. The Snapdragon 855 should deliver real-time portrait modes or be able to detect objects with relatively low power consumption. The built-in memory controller supports up to 16 GB LPDDR4x RAM (4 x 16-bit). Moreover, the Adreno 640 has 50% more compute units (ALUs) than the Adreno 630, while Qualcomm claims that it should be 20% faster than its predecessor. We currently do not know what clock speeds the Adreno 640 will operate at as Qualcomm did not announce these during the announcement of the Snapdragon 855. Qualcomm will manufacturer the Snapdragon 855 at the Taiwan Semiconductor Manufacturing Company (TSMC) using a 7 nm FinFET process. The switch to 7 nm manufacturing should make the SD855 20% more efficient than the SD845. Qualcomm has not officially announced the thermal design power (TDP) of the SD855, but we suspect that the SoC will reach a maximum of 5 W and will average around 3.5 W under load.